Note: some other posts (and updates) related to this project are from Dec 09, Oct 07, and Oct 05.
hey. It's been about a month since the Maker Faire, and I wanted to show some peeps new iterations of the back-lit carvings I've started doing, so I thought I'd finally post this. check it out. The rest of this post I'm going to talk about what I've learned from doing this. The questions to answer: What's going on here mentally for the viewer? What have I learned about materials? What have I learned about images? What's next? Sitting at a booth and explaining this over and over again made me really think about what's going on here in the mind of the viewer. Why is it interesting at all? As far as I can think right now, there are four elements that confuse the viewer and make the effect surprising. 1. More than a photographic print or a projected image, this technique brings your awareness to the way light creates the image. You see it, you know it's back-lit, so you think the light source you are supposed to interpret is behind the surface. It's as if you expect a silhouette. This conflicts with the impression of a different distinct light source in the image. So, for example, the face above looks lit from the left, though it's actually lit from behind. 2. Another way there's a bit of a mental bender here is that you know that you're seeing transmitted light passing through a translucent material, but the experience of the image above is that you're seeing reflected light bouncing off opaque skin. 3. You know you're seeing a topographical surface rather than a simple projection, so your mind is constantly flipping back and forth between seeing the topographical surface and the image the light creates. 4. The specific topography of the image also creates some serious distortion when viewing the image off-angle. Viewed off-angle, the image is almost unreadable. It becomes even more so when it's un-lit or projected on a curved or off-angle surface. The experience of walking by the object is really nice for Halloween because you can't really understand the object until you pass the precise angle at which the image is legible. There's a surprise factor when the image suddenly pops out at you. These four factors combined create an experience of cognitive dissonance. It was kind of fun sitting at the booth and watching people react to the baby face. From a distance the image looked like a simple projection. But when close, the mind starts to reach for other explanations of what the object is. Watching the faces of the viewers was interesting - lots of knotted brows, blinking, and "whoa" expressions. It's almost like it makes you dizzy. Speaking of cognitive dissonance, it was really surprising how many people entered the room and said, "I can really smell the pumpkin in here!" It seems that the mental cue of "carved fruit lit from within," made everyone think that the smell was pumpkin. There was a strong smell in the room from the heated watermelon, but it was clearly a watermelon smell once you were able to get past the idea of a jack-o-lantern. When I pointed out to people that there was no pumpkin, they were pretty surprised by that too. Ah, the human brain; how we are creatures of habit. okay, so that's about as much as I've thought through what makes this technique interesting. For the Maker Faire, I put most of my effort into trying new materials. Though I only ended up showing stuff in styrofoam and watermelon, I tried some other things which aren't ready to show yet. So far, pumpkin is still the best material to work with, except for the rotting factor. I definitely had the best range of shadows working in pumpkin. The styrofoam had a good gradient and was easy to work with, but there's no point where it becomes completely opaque, so you never get a real black. Pumpkin naturally has a skin on it, so you can get pretty decent blacks when it's back-lit. It also has a pretty dense flesh, so even after you take off the first layer of skin, you've still got a pretty dark shade to work with. Watermelon, on the other hand, has a very translucent flesh and rind. As soon as you remove the skin of the watermelon, you get a very hot spot of light. If I went down to a small-wick candle for the back-light, I may have had more range in the shadows, but I wouldn't have been able to display in the low-light conditions I had; I would have needed a pitch dark room. In the end I had to work most of the darker areas on the watermelon just by scratching the surface of the skin. Just scratching the surface meant that the depth of the carving was lost and so the interesting distortions when viewing off-angle were also lost. sad. Conclusion: watermelon is delicious but annoying. Perhaps cantaloupe would work better. To imitate the pumpkin skin, I thought about skinning the front of the styrofoam with spray paint, but I ended up not doing it. I prefer the idea of solid materials to layering. To me, the cool thing is that the image is created from the carving depth, not by line drawing or outline painting. Start by determining the level of light you're going to have at your display. 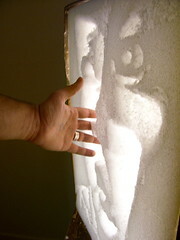 And that determines the thickness you need of your material for it to be fully opaque in front of your back-light. At this point, pick a semi-transparent material that can be near opaque at a reasonable thickness in front of your back-light. An opaque skin on the front may be helpful. I fielded a lot of questions about image selection at the Makers Faire, and what follows is the best advice I've been able to come up with. use images that have strong directional lighting. You may have more than one source of directional lighting, but very diffuse light is not good. Stronger gradients are better. Camera-mounted flash-photography is bad. something that needs very fine detail for it's impact makes the carving very tedious - so avoid extreme subtlety in expression if you're doing portraiture. make sure you're picking an image where the light source in the image has an interesting interplay with the back-lighting. So don't pick a silhouette, or something front lit. it should be off-angle lighting to emphasize the cognitive dissonance i talked about earlier. for the rest of the intstructions, you can still check the instructables site. Well, one thing that should be clear from the images I've carved so far is that I've been paying a lot more attention to materials, mental processes, and the light characteristics of the images than I have been paying attention to the content of the image. I also haven't yet given enough thought to how the reflectivity of the front surface of the material could interplay with the translucence coming from the back-light. 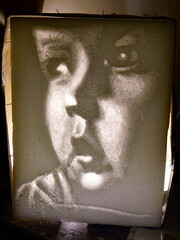 My next plan is for some reflective carvings instead of doing them back-lit. I think I'm going to stick with portraiture, but I'm going to try to put more effort into making the content work.